WELCOME to Orchard Valley United Church, and thank you for stopping by our web site. This faith community is made up of four former pastoral charges from the area. We have members from Canning, Cambridge, Canard, Coldbrook, Grand Pre, Gaspereau, Greenwich, Kentville, New Minas, Port Williams, Wolfville and places in between. 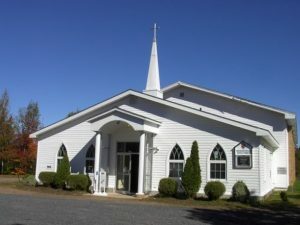 On July 1, 2012, the first church service of Orchard Valley United Church was held. We continue to worship in the former New Minas United Church building which became Orchard Valley United Church. We are a caring community and we want all who come to feel welcomed, valued and supported. We seek to deepen our spiritual understanding and we invite you to join with us as we grow and explore our Christian faith, living in honesty and compassion, and reaching out to others through our worship and action in our community. We are located in New Minas at 130 Cornwallis Avenue, at the very end of the street, overlooking the dykes. Cornwallis Avenue is the street opposite the County Fair Mall which contains the Sobeys grocery store. Check the Location & Contact Info tabs for more information. We are wheelchair accessible and there is plenty of parking, both in front and behind the church. Worship is relaxed and informal. There is a table at the front of the church, left side, where children’s craft supplies are kept, and children are welcome to use them before they go off to their Sunday School. Music is a beautiful part of our service and we are blessed to have a talented choir and great music director. We offer two worship services each Sunday – a contemporary and informal service at 9:00 am and a more traditional service at 11:00 am. Everyone is welcome to attend either service. The Sunday School meets with the 11:00 service and a children’s activity table is featured at the 9:00 service. Folk are encouraged to go back and forth between services to ensure that we remain one church family. Also, there’s a desire to increase the attendance at the 9:00 am service. By attending at 9:00 we free up seats at 11:00 – making room for others to join us in worship at OVUC. So feel free to attend either service, but do come! If you are looking for people to join you on your spiritual journey, please feel free to join us as we find our way together. Please sign our Guest Book and we encourage you to return.